There are summer steelhead in the McKenzie and Middle Fork of the Willamette Rivers, and targeting them properly is what it takes to catch them effectively. I am going to discuss how to go about targeting the steelhead on each of the two rivers. The McKenzie River is going to be the first river I will discuss, and catching summer steelhead on this river is a little different than your average river for summer run fish. 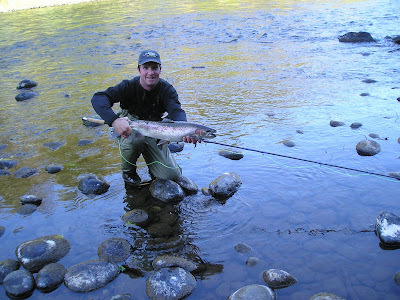 You can fish the way that you will fish for summer steelhead on a river like the Deschutes, and you may pick up a fish here or there, or you can fish the McKenzie River the right way, and you will catch fish with regularity. The first thing about the McKenzie River is that it is cold and clear all summer long. It doesn't warm up like many of the rivers around Oregon; where they will have summer water temperatures in the mid 60s or higher. 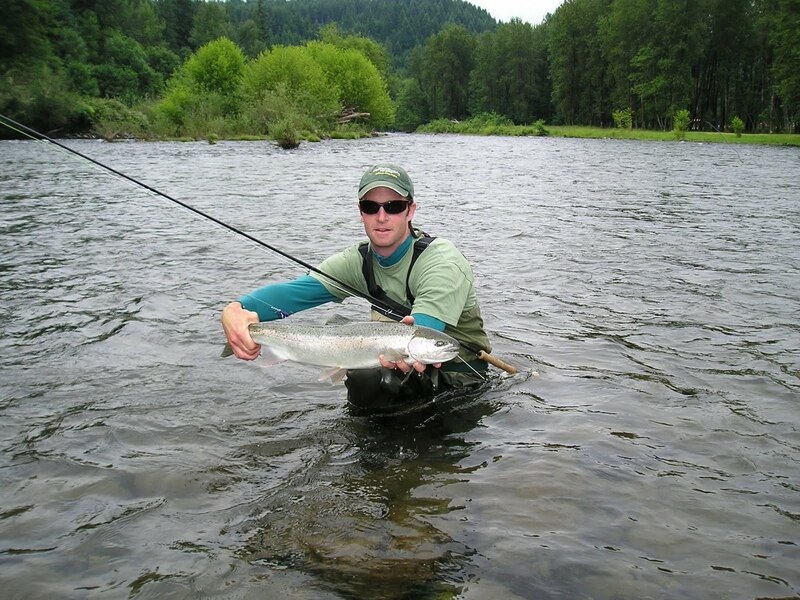 The McKenzie River runs no warmer than the upper 50s in the steelhead fishing portion of the river. Typically the river can be in the low 50s, and even around 48 degrees into the end of June on some years. The river is very clear, and the water runs rather swiftly. With that being said, the fish tend to hold in classic steelhead water, but some of the tailouts, runs, and riffles may be running a little faster than some of the standard steelhead rivers you may normally fish. The trick is that the fish are holding in the same speed water that they always would hold in, but larger boulders are what is breaking up the current speed and creating that "walking speed water" that we steelheaders are seeking to present our flies in. There still are slow deep pools fading into glassy slow tailouts with fish holding in them, but there are a lot of the types of water that I mentioned earlier. The McKenzie steelhead should be fished with a cold water mentality. 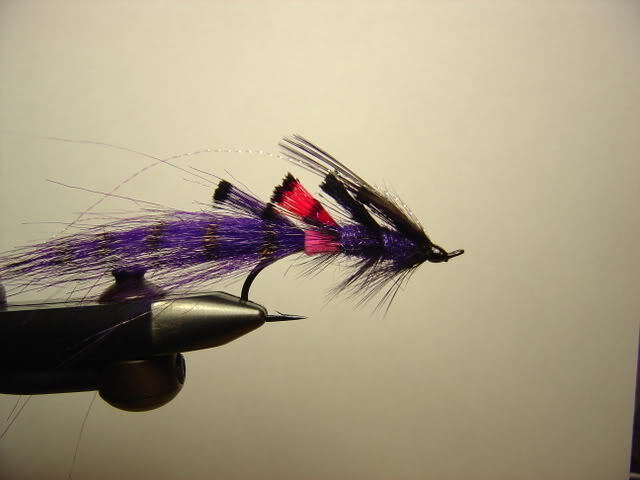 Deeper presented flies will take more fish in colder water. Typically, I fish a variety of sinking tips with a multi-tip set up, and that can be done two different ways on the Mac. You can fish from the drift boat, and you can fish single handed rods, and weighted flies. In the case of my boat, I run a Clackacraft; so I can have two people fishing at the same time, and often I will have the person in the front of the boat with a floating line and a motion prawn. The person in the back of the boat (the second fly through) typically has some sort of a sinking tip; which could be a Type II (Scientific Anglers) or Type III (Airflo or Rio), and the fly would be a Moal Leech with the color being black with blue. This way the first fly through the water is traveling higher up in the water column; while the second fly is traveling lower and slower right behind the first offering. Sometimes, I am running the boat with someone fishing one side with a floater because it is only about 2-3 feet deep; while the other side of the boat will have someone running a Type V sinking tip because it is swifter and 4-5 feet deep. You want to analyze the water that you are going to fish, thinking about depth, and how fast it is flowing. That will help you decide the density of sinking tip to use, and if you want a heavy fly, or a lightweight fly. The same approach can be applied to spey fishing from the banks of the river. You can pull the boat over, and get out to swing away with two handed fly rods, but you should think about the sinking tips to use for the given piece of water that you are going to be fishing. A Skagit Head System is the best choice for a fly line for your spey rod while fishing the McKenzie. For the spring, you can use T-11 or less dense sinking tips, and 12-15 foot type III to Type VI sinking tips will be the best for the typical spring and early summer water levels. Also, don't forget that floating tip for your Skagit Head, because you can throw a large weighted fly off of the floater, or you can even skate a DRY FLY for one of these summer steelhead. Another productive method for catching McKenzie Steelhead is nymph/indicator fishing. I would recommend using a Thingamabobber, stonefly nymph, and an egg dropper for McKenzie River steelhead. I prefer to nymph fish to fish that are spotted and holding. Also nymphing the water that is slotty and focused is where I dead drift flies; while I prefer to swing in the bigger broader water. Some spots are too small and too slotty to swing, while other spots are too vast and ambiguous to nymph ; unless you see a holding fish to present your fly to. This is how I like to fish on the McKenzie River, and it is literally due to statistical evidence of fishing the river for years, and spending day after day on it. I understand that other methods will produce steelhead out there, but these are tips for someone wanting to go there, and wanting some recommendations that I know will produce. giving out all of your secrets! Thanks Bri!